49. 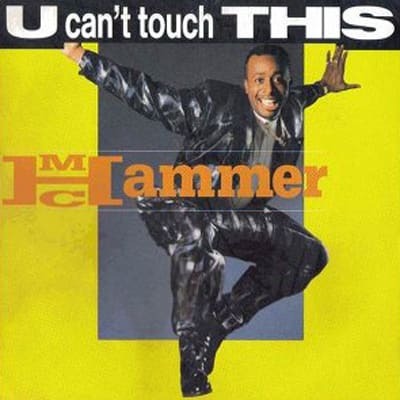 MC Hammer "U Can't Touch This"
Hammer's legacy has become a bit of a punchline these days, but there's no denying that he was on top of the rap world when he took over the pop charts with "U Can't Touch This." Rapping over a funky sample from Rick James' "Super Freak," everything from the huge pants he wore in the video to catchphrases like "You can't touch this" and "Stop... Hammer time!" became huge pop culture references. The song also helped Hammer sell 18 million units—and gave him the financial resources to start spending like a madman. Unfortunately, Rick James sued, got a profit-sharing settlement out of court, and Hammer eventually went broke trying to support a payroll the size of an NFL starting roster. But that doesn't dampen the impact that this song had in softening the opposition of mainstream America to rap.